Yahoo isn’t putting on the stops in its efforts to personalize the user experience for you. In the latest move, it has dusted off My Yahoo and given the personal start page a fresh look. The new design is a refreshing change from its static avatar of recent times. 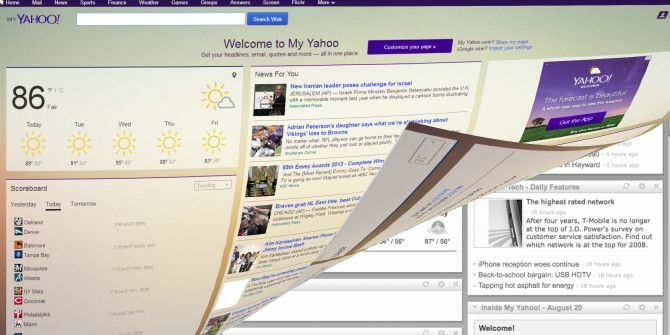 The start page is meant to be the portal that ties together all of Yahoo’s offerings — email accounts, calendars, stock portfolio, sports scoreboard, weather, Flickr, and web content delivered by Yahoo or a web search. The latest redesign also puts My Yahoo in the contention ring of iGoogle alternatives. Google has said that it will be shuttering its own version of the personal start page by November of this year. Users can easily import their iGoogle preferences. The modern design on display at My Yahoo could have its fair share of takers with its ease of personalization. You can dress up your own profile with a range of cool new themes from designers, artists, bands, and more. My Yahoo has apps on offer which connect you to services like Gmail, USA Today, Wall Street Journal, and Washington Post among others. Yahoo also allows you to add content from a diverse motley of sources – from art to style. If you like to have a personalized start page, My Yahoo could be place to park your preferences. Take a peek and tell us all about the new design – hate it or love it? Explore more about: Homepage, Yahoo. Its is just god awful, and now they are forcing the Canadian page to switch over on March 24th so that option is gone. I hope Yahoo goes bankrupt within the year, companies that try and force their customers to accept changes they don't want should go away. I have been on My Yahoo from the very beginnings, and they are forcing me into this new version on January 31st. It will be irreversible and anything resembling the current version will not be an option. Crazy. Perhaps there is some master plan to shake off the old base and build a new one. Sound like a recipe for Yahoo's demise. Anyway I will likely be hunting for a new home page in a few days. Too bad, I loved the features of My Yahoo. You just have to scroll up and see the world agrees with you :) I wonder, how difficult it is for someone to design a fantastic and user-friendly home page? Especially, when you have the resources of Yahoo at your command. They could have started a competition around it and got some free publicity. Plus, a good home page at the end of the day. "Typed in “alternative to My Yahoo” and got to this page" This is how I got here too. It is Absolutely HORRIBLE! I will NOT use it!!! My teams used to be the scores I saw, and only the teams I chose. My fantasy football was available from my myyahoo page, not anymore, that huge add right on top in not movable, we had the add before, but I was able to put it at the bottom. I HATE the look and feel completely. I was able to customize my weater the way I wanted it, the cities I needed or wanted to know about. It is no where near as user friendly, and if we are not given the opportunity to choose the original version I will no longer be a myyahoo user. Typed in "alternative to My Yahoo" and got to this page, where I read a stupid puff piece praising Yahoo! for its inventiveness and willingness to change. Really? Well, then, change back! Ever since the new change was forced upon us, I have hated My Yahoo. Simply let me change back... that's all I ask. In the meantime, I am going to Google and do another search. I need to cut my ties to My Yahoo today. It's driving my crazy! The new my.yahoo is worthless and yahoo is going to lose millions of users because they won't let people select the old layout style. The new style is like the junk mail fliers you used to get with snail mail. Totally agree with your points on Flickr and the so-in-your-face ads. There are far better third-part alternatives in my opinion. I have used MyYahoo for years now and I tried to be a trooper and give the new look a try. Now after several months I can't do it anymore and am looking for an alternative. --Biggest issue is screen space. What used to fit on my screen now takes a scroll or three. --All those fancy templates, have to be configured FOR EACH TAB. I have several tabs of feeds based on the common theme of the websites. For each tab I have to configure the fancy new colorful template. There is no way to make a site-wide change. -- I have the "most interesting" flickr feed. I used to be able to mouse over each image and it would become larger. Now I get a fixed thumbnail size and if I want to see it in a larger size I have click on the link and am redirected to flickr....Is this yahoo's way to shove more traffic to flickr, wait...doesn't Yahoo own flickr? --The large add in the upper right corner is LARGE and it almost always advertises for some portion of Yahoo. Hey yahoo, guess what, I"m already using MyYahoo, you don't need to advertise more Yahoo to me. I'm here...at yahoo. I do not like the new My Yahoo. I do not like it at all. Used to be my homepage, but I'm looking for a replacement. I do not like forced change. Anything specific about it that made you go the other way? I started with My Yahoo but after that I found portalpanel.com is more interesting and useful. Its simple home page allows you to bookmark your favourite websites and links in separate folders which makes it very neat and clean. Besides, you have control on some of your social networks, like Facebook, LinkedIn and Twitter, as well as Yahoo weather. You can also get the latest news you are interested in delivered right to you, by its RSS reader. The latest update for Portalpanel brings Google Bookmarks import feature. So you can easily import your old bookmarks into PortalPanel. It works safely (HTTPS) and perfectly in different browsers and I would suggest to make it your homepage and enjoy its simplicity. PS I actually quite liked their slogan: “One Page to Rule Them All”. It seems to be very true. It looks cool too. Thanks for the suggestion. The new My Yahoo is awful! I've lost all the portfolios that were set up in the old version and many useful modules seem to be unavailable. all this for a style and color makeover? Obviously they did not have their users in mind when they made this arbitrary change. I like My Yahoo, but I also use http://www.hinto.co because it's very visual and I can see all the news at a glance. My Yahoo is now a much *less* personalized experience than ever. The redesign removed so many possible customizations that it is now nothing special at all. It seems all the "improvements" touted by every pundit are purely cosmetic. Indeed, this article's first concrete example of the new My Yahoo reads "You can dress up your own profile with a range of cool new themes from designers, artists, bands, and more". Oooooh! Aaaahhh! Coool! New themes! New designers, artists and bands! Oh my! The scoreboard used to be completely customizable; i.e., I was able to define "my teams". The scoreboard would give me the scores for *only* those teams. Now? My Yahoo does seem to have some sort of sense about which city I'm close to. But added on to the scoreboard are countless other scores from teams I could give a rat's a** about: Howard vs N.C. A&T, or Cal Poly vs Portland St. Really??? Of the six scores in the scoreboard this morning, only ONE is of any interest to me. The other scores serve only two purposes: to waste valuable screen real estate, and to alienate countless long time My Yahoo adherents. My second example is this: previously I could minimize any content window with the single click of the +/- button. This was useful to reduce clutter, save on screen space and, perhaps most importantly, hide sensitive info (e.g., my personal email) to over-the-shoulder lookers at the workplace. Isn't that Yahoo CEO the one that used to work for Coca Cola and who came up with "New Coke"? No, she was the first female engineer at Google and one of their earliest employees (Nos.20). Her list of accomplenishments is quite impressive. ...in a nutshell, she is the 'Barack Obama' of industry movers and shakers...a worthless embarrassment that got to where she was via PC-bonafides and NOTHING else. Used it for YEARS -- but I made a mistake and looked at the new version (which stinks, big time, at least for me) and realized I can't "unlook" -- there's no going back. Now looking for an alternative that Google won't close. http://my.yahoo.com/switch got me back to the old design. Ever since I started using the Internet on a regular basis, about a dozen years ago or so, My Yahoo! and I have been good buddies. My Yahoo! is still the first thing that pops up on my PC screen when I sit down with my first coffee of the day. I’m a big fan of, perhaps sucker for, the personalization of one’s computer experience; content, lay out, themes, colours, you name it and I want to be able to adjust it to my liking. Hence the attraction to My Yahoo! But I feel my old pal may be trying to pull a fast one on me. Some habits die hard :) But the online world is just like that...there is no permanency. Yahoo is trying way too hard. They need to be gutted, cleaned out and start all over. They simply lost it when google came on scene. Well, at least they are moving. They were practically dormant for a few years. Marissa Meyer has invigorated them somewhat, so I will give them some more time. It's good for us consumers because overt dependence on one company could be counter-productive. We have already seen Google pulling the plug on popular products. ...how's that wait working out for ya, Saikat? That's why Yahoo lost it when Google dominated them. Their right now trying to find their own niche in the shadows of Google. It's going to take them at least a decade for Yahoo to comeback as a powerhouse of the Internet. Their best bet is for Yahoo to find their own niche in the internet market and focus on that like laserbeam. I have been using My Yahoo! as my homepage ever since the days that Blue Light was supplying free dial-up internet back in the early 2000's and using Yahoo! Mail as their mail service. I'm rather disappointed in the fact that they have dropped some of the available modules that worked on the old version only just last week and I'm hoping that it's not a permanent thing. There is also an annoying ad in the top right corner that can't be moved. I don't really like it but I imagine that I'll get used to it once I've used it for a while.